This Cretors machine was mounted on a new 1925 TT chassis. It was manufactured in Chicago. It is one of only two like it ever built. The other one is restored. It was family owned since new, and was used up until the 90’s. 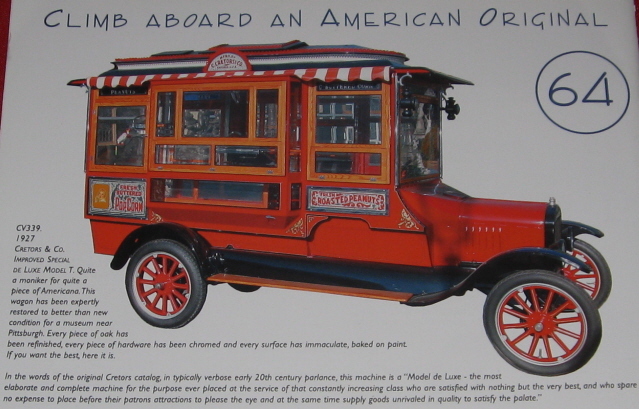 It was used in New York, Massachusetts, Vermont and Connecticut traveling the Fair circuit. For a number of years it was driven to Florida in the winter for the Fair circuit down there. They drove it non-stop, switching drivers and sleeping on the floor as they went. The originals owners’ daughter used it until 1998. She died in 2007 at the age of 92. After she died it was auctioned off. Jay Leno was a high bidder. When he learned the Saratoga Auto museum was trying to acquire it to keep it in the local area, he graciously decided not to buy it. 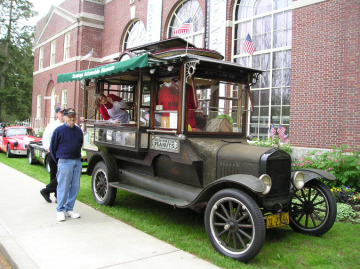 Don Buesing, a Model T enthusiast is associated with the Saratoga Museum. He figured out how everything worked and got it up and operating, which was no easy task, as there were no operating manuals with it. It’s now used in the summer months as it once was making popcorn. Don was very instrumental in keeping it from being restored, which would have diminished the history and value of this vehicle. You can’t believe how original and what great shape this is in for how long it was used. This is an unbelievable piece of Model T history. I can’t describe the feeling you get when you see this in person. It just puts you in AWE of how original it is and the shape it is in. This is one time picture doesn’t do it justice. If you want further information here is a link. It would be great if one of the T guys that lives near there could photgraph it in detail and do a write up on it for one of the T magazines. It sure has a neat history. Here's a fully restored 1927 that was auctioned off in 2004 by Red Baron in Atlanta, Ga. Interesting that they put the cowl lamps up that high. You would think that they would have not felt a need for them. 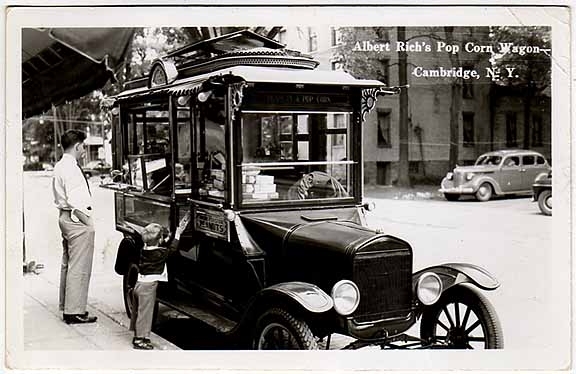 I think a "popcorn truck" may have been more common than thought. I know there was a similar vehicle in Austin, Texas in the '30's, I am sure it was not one of these, but back then, people were doing anything for a buck. I want to think it had a bell of some kind, like an ice cream truck later on. I wonder now how he powered his popper, probably over an open flame.